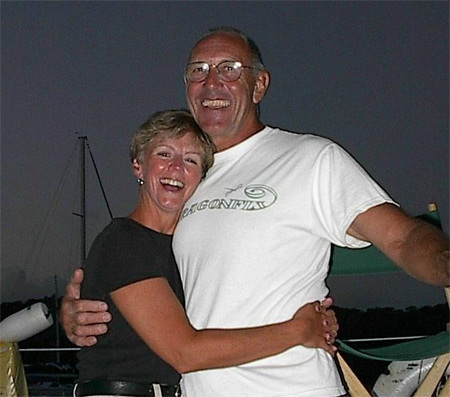 Below is a recent "20 questions" interview with Al & Jill Wigginton, the owners of Dragonfly, a 65 foot sailing catamaran currently operating as a charter in the Caribbean. What makes this interview unique is that at the end of their 2013 season, after 14 years of operating a successful charter business in the Caribbean, logging over 70,000 sailing miles and building a loyal charter following, they have decided to relocate to the Kingdom of Tonga in the South Pacific to operate as a Floating Health Care Clinic for Sea Mercy (www.seamercy.org), a US based non-profit 501(c)3 that serves the remote island citizens in the South Pacific. #1 Al & Jill, that's an impressive sailing resume and bio. So what prompted you to leave behind such successful waters to partner with Sea Mercy as a Floating Health Care Clinic in the South Pacific? We are ready for a change. We love sailing and have greatly enjoy giving people the opportunity to experience the sailing life. We've met lots of people from different walks of life and within 1-2 week trip most have become friends. Many of them have been changed by the experience by helping them to focus on what is important in life and expanding their boundaries. This has given us a sense of satisfaction/purpose which wasn't expected yet became an important part of our lives. When we heard about Sea Mercy we realized that the program exponentially expands on sailing with a purpose. We will still be able to share the sailing experience with the healthcare professionals in an areas we've dreamed about exploring, and best of all, provide people who need and deserve better medical care. #2 You mentioned "sailing with a purpose" can you clarify what you mean by that? There needs to be more to life than sailing from point a to point b. We have always wanted to do more than just existing in our own floating home. So having the opportunity to help others or enhancing others lives is something we've always pursued. Sea Mercy gives us the opportunity to do what we love and contribute to the greater good. #3 As a relatively new organization, why did you chose to join Sea Mercy? Rich, Stephanie and family sailed with us for two weeks a few years back. It was a great experience for all and we've kept touch. Once we heard about the Sea Mercy program, we knew that it would be a great fit. They are terrific people with similar goals and dreams and the ability make the dream happen. We also believe that Dragonfly would be a great platform for one of the clinics in the pristine waters of the remote islands. #4 What do you mean by the "remote" islands, I mean all the islands in the South Pacific seem pretty remote? We often think of South Pacific island nations as consisting of one or two islands, when in fact there are hundreds of islands that are part of the island nation. For example, the island nation of Tonga has 1 main island and 170 remote islands. Many of the islands have no roads, power lines, telephones or airports to connect them. Many are hundreds of miles from the primary island and any health care. The end result is that many of the remote islands do not have even basic health care services available to them. As well as limited access to the things Americans have become accustomed to like easy access to food, supplies and Internet. #5 So Dragonfly will be carrying the medical supplies and health care professionals to meet those needs? Yes. Operating on a scheduled visit rotation, each excursion will last from 2 weeks before heading back to resupply (medical supplies, food, fuel, new volunteers, etc.). Our goal is to reach all the remote islands multiple times a year, not just once every 2-3 years. #6 So instead of vacationers, your new charter guests will be a rotation of health care professionals? Yes. International and local health care professionals. The local health ministry staff will assist our international staff and act as translators, interface with the local islanders, etc. and in turn, our international staff will assist the local health care staff. #7 So as a Sea Mercy Captain vessel, how does your relationship with Sea Mercy work exactly? Each working relationship will be an arrangement based on the desires and ability of the owners and the needs of the local island nation. In our arrangement with Sea Mercy, we are committing to the first few years of operation, with a few personal weeks scheduled in. Sea Mercy covers all of our operational costs, fuel, food, fees, etc. Depending upon your length of service with them, they also provide a maintenance/user fee to offset the typical wear and tear cost of operating your vessel. #8 So you're definitely not in this for the money? No. This is not about making money, instead it is about having an incredible experience and adventure that Sea Mercy covers. So instead of monetary tips, we'll probably get some great tips on how to treat a cut, dress a wound, or eat healthier... maybe a free checkup. #9 How long do you anticipate staying at each remote island? It really depends on the population and needs, 1-2 days to perhaps a week or more. #10 How long are you and your wife considering operating as a Sea Mercy vessel? Were not sure, but we will start in Tonga, perhaps shift the next year to Fiji, or maybe Vanuatu... we'll see where the wind and need takes us. #11 So Sea Mercy will be working with other island nations as well? That is their goal, their first year of operations will be in Tonga, then as approval, volunteers and more interested owners/captains are willing to participate, they will expand to these other islands. #12 Is it all work, no play for you and Jill while working with Sea Mercy? Although our first priority is meeting the needs of the remote islanders, we do have the freedom and flexibility to schedule personal time with friends and family who want to come out and spend time with us. We just need to schedule it in advance so that Sea Mercy can organize their health care volunteers around it. We are doing something we love with countless rewards. Is that really work? #13 It's a long sail from the Caribbean to the South Pacific, is there anything different you are doing to prepare? We are accustomed to sail the 1500 miles between FL and the Virgin Islands. But we haven't sailed 3000 miles in one shot or sailed in the Pacific. So we are doing a lot of reading to get a better understanding. The ability to get replacement parts along the way will be very limited, so we are making an inventory of parts which might be needed. We'll also need to provision for the extended sail and with things that are difficult to get in Tonga. #14 That sounds expensive, does Sea Mercy offer any help in getting your vessel prepared? Each Sea Mercy Captain arrangement is different. Because we are committing to a long-term partnership with Sea Mercy, and the safety and comfort of their volunteers while on Dragonfly is very important to them, they have offered assistance in meeting some of Dragonfly's upgrade needs to prepare it to operate as a floating health care clinic. #15 What challenges do you foresee sailing Dragonfly in Tonga compared to the Caribbean? The challenges will be similar to what we experienced when we first started sailing in the Caribbean. Everything was new. Everywhere we go will be an adventure of learning about the anchorages, waters, people, and supplies. Also, we expect the cultures to be unlike anything we've experienced in the Caribbean because they are far more remote. I think communication with family and friends, access to news and the internet will be much more limited than we currently experience. Throughout the Caribbean we have access to Sirius radio where we can get the news. In many places we can use our US based phone, so talking with family and friends is easy. Except on the long passages we can get access to the internet. I don't believe this will be the case in the remote Pacific Islands, so we will need to find new ways to keep up to date and in touch. #16 Cyclone season in the South Pacific is from November through March, what are your plans for Dragonfly during that 5 month period? In the Caribbean, we relocated to Florida. In the South Pacific, our plan will be to sail to New Zealand or Australia (their summer) and fly back to the US to spend time with family, then fly back in March and sail back to Tonga or Fiji, or wherever we are needed for Sea Mercy. #17 Are you required to commit to all 7 months of the program? We have, with a few personal weeks scattered within it, but that is what we desire. If you only want to operate for 2-3 months at a certain island group, and then move on, that can work as well. Because there are a lot of resources and people (volunteers and islanders) counting on your arrival and participation during that timeframe, if you commit, you just need to make sure you can honor your commitment. #18 What if there are mechanical issues with Dragonfly, what do the volunteers do while it is being repaired? During repairs they will either work at the understaffed and undersupplied remote health clinics and/or hospitals until repairs are completed, or transfer to one of the other Sea Mercy vessels operating in the South Pacific. However, we will be planning on having requisite spares to minimize this. Also Al built Dragonfly so he knows it very well and has demonstrated his resourcefulness to get/keep things running. We never experienced the inability to meet the travel plans of our guests and don't expect to as part of Sea Mercy either. #19 So how does a owner/captain get started with Sea Mercy? You start by completing the online Sea Mercy Captain form and then the mutual dialog and interviews will begin. Our experience was that Sea Mercy is about making sure the experience is what you want as an owner and meets your personal dreams and goals, not just theirs. If things match up, they will schedule a time to meet with you, review your vessel, and finalize a successful plan of action to work together. #20 Final thoughts or suggestions for those considering exploring the Sea Mercy Captain program? It's not for everybody. Like operating a charter business, it's about meeting the needs of those who you serve on your vessel and the places you visit. In this situation, it is the health care volunteers and the remote island people. We think of it as a "working holiday" that allows volunteers to visit some of the most incredible islands, to impact the lives of the local population, and to build incredible relationships with health care volunteers who were willing to give of their time and talents to meet those urgent needs. If you're looking for or expecting anything other than that, this is probably not for you. To learn more about Al and Jill and Dragonfly, visit the Dragonfly - Sea Mercy's Flagship for Tonga page on the Sea Mercy Website.